The holidays have come and gone, but for some, Monday night’s game couldn’t end quick enough. This was undoubtedly the thoughts Ravenwood was having as Brentwood goalie Ryan Bobrow picked up his second shutout of the season and led the Bruins to a surprise 5-0 shutout over the Raptors. 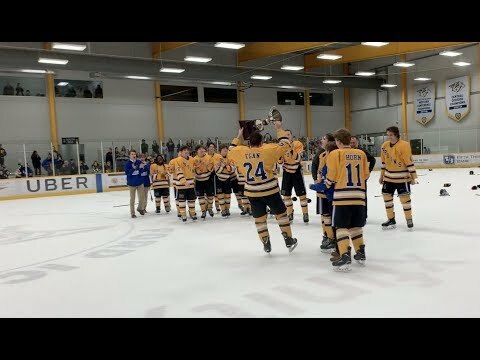 This win now leaves Brentwood the only team undefeated in the Greater Nashville Area Scholastic Hockey League with 20pts (10-0-0) and securely in first place. Even though the game started at 8pm, the stands were already filled with fans, student groups were against the glass and the music was playing well before then. The feeling in the air was almost reminiscent of a playoff game and warm-ups went underway to loud cheers. After a few last minute instructions, the puck was dropped and the first frame was underway. It started of even keel as both teams sized each other up, attempting to enter the other’s zone but getting turned away. Just 50 seconds into the game though, the Bruins had a shot on the power play as Raptor’s Peter Cloud was called for interference. The Raptor penalty kill was up to task, blocking all four shots taken against them with the best shot coming from a strange ally op shot from Bruin’s Ashton Allain over traffic in the slot, but Raptor’s goalie Thomas Ito saw the puck easily and grabbed it. The Raptors got a power play chance of their own for just under two minutes as Bruin’s Justin Knapp cross-checked in traffic. There was little to see on the Raptor’s power play though as the Bruins penalty killers easily contained them and play resumed five a side. Allain made a wonderful rush to the crease but Ito easily blocked him and sent the puck back down ice. With momentum slightly in Brentwood’s favor, Raptor’s Liam Hussey found himself on an unexpected breakaway as the puck came to sudden stop between the Bruins defenders. Hussey pounced on the puck and all alone in the slot, challenged Bobrow. The crowd held their breath as the shot left his stick and he beat Bobrow, but his aim was just high and the puck rung off the cross bar and sailed back into neutral zone amidst a cheer from the Brentwood crowd. With the crowd behind them, the Bruins were finally able to open the scoring as they scooped the puck up and on an odd man rush, Allain and Ethan Demumbrum worked the puck between them in a tic-tac-toe pattern to find Benjamin Wallace who shot the puck while falling to his knees, beating Ito at 6:33 to make it 1-0. The crowed was brought alive and as play resumed in center ice, the Brentwood student section started to chant Ito in a very familiar NHL fashion. The face-off had barely been won before the Bruins found themselves on the penalty kill with Brennon Williams given two for roughing. As earlier, the Bruins easily contained the Raptors power play unit and in a surprising turn of play, Bruins Nathaniel Biron picked up a shorthanded goal unassisted beating Ito high glove side at 5:35 making it Bruins 2-0 in less than a minute of play. The only shot taken on the Raptors power play was from Brayden Fross which Bobrow scopped up easily. The fun continued for Brentwood as they continued to pepper the Raptors with shots. The Raptors were finally able to clear their and bring some pressure on their own. With the period drawing to a close, Bobrow stopped a shot and the Bruins cleared the puck down ice. It initially looked to be an icing but Ito gloved the puck as it came to his net and in the strangest turn of events, Bruins Nadasdi Hudson took a whack on Ito’s glove. The puck was not as secure as Ito thought it was and it slid out of his glove and into the back of the net giving the Bruins a 3-0 lead at 3:08. Brentwood continued to pressure the final few minutes of the period and the first couldn’t end quick enough for the Raptors who skated back to the bench to regroup during intermission to the tune of a very raucous Brentwood crowd. The second period seemed to be a bit more curtailed as Ravenwood found their footing and began to bring pressure, but Brentwood was able to push back and for about five minutes both teams circled around taking shots, but nobody was able to get through. Ravenwood almost got on the board as a cross ice pass from Brayden Fross passed through traffic to the net with an open back door, but no one was home to put it in. The back and forth continued until Brentwood again found the back of the net from Sean Eagin in the slot who lifted the puck over Ito’s shoulder. He was assisted by Nathaniel Biron and Ryan Coliano in the goal making it 4-0 Brentwood. The rest of the period continued to be the same, each team trading chances. Brentwood had another chance on the power play with Raptor’s Peter Cloud taking a seat for cross-checking. The Bruins were unable to convert though and play evened back up. The Ravenwood offense was clicking through the period, but every time Ravenwood put pucks on net, Bobrow was there to stop them and stood tall when called upon. Just 59 seconds into the third, the Bruins striked again as Justin Knapp was fed the puck by Jacob Layne and toe dragged Ito, beating him high stick side giving the Bruins a 5-0 lead. The game began to get chippy with the benches calling for penalties as several questionable plays were allowed to slide. Penalties were finally called as Brentwood’s Allain was given one for tripping and Ravenwood’s Luke Willaims for slashing led to four on four. Neither team was able to capitalize. A final penalty was called on Brentwood’s Jackson Clydesdale for interference, but Ravenwood could not get on the board as the clock wound down. In the end, Brentwood pulled off the stunning upset, blanking the Raptors. They extended their win streak to 10-0-0 and firmly secured first place in the league. Shots on goal were in favor of Brentwood, 33 to 25, and Bruins Ryan Bobrow claimed his second shutout of the season. Ravenwood head coach Matt Eddinger spoke on his team’s performance during the game. Brentwood looks to continue the undefeated streak on January 19th at 5:45om as they take on Pope John Paul II-CPA at Ford Ice Center, north rink. Ravenwood will play Nolensville/Ravenwood2 on January 22nd at 6:15pm at Ford Ice Center, North Rink.